Discover fun and educational events happening this week in western Massachusetts, along with announcements, upcoming events, links, resources and the HFVS podcast. If you have a community event, educational program or service opportunity for youth/families happening in Western Massachusetts that you’d like to let us know about, self-post your event at any time on our “Suggest An Event” bulletin board. The events below are “suggested.” Please take the time to confirm that these events are happening, along with time, place, age appropriateness and costs before attending. Serving Western Massachusetts since 2005, Hilltown Families supports development and enhancement of our local economy and community. Local businesses, individuals, schools and non-profits are encouraged to partner with Hilltown Families through sponsorship and advertising. Let us help get the word out about your after school/homeschool class, event, camp, workshop, fundraiser, business/school, service, open house, volunteer opportunity or general announcement. Deliver your message to thousands of families living throughout the four counties of Western MA while supporting the community development work of Hilltown Families… help us help you! Click HERE to find out more. Over 50 Summer Camps to choose from! Now is the time to start signing up for summer camp! Check out our featured post, 2014 Summer Camps and Programs in Western MA for a comprehensive list of over 50 summer camps & programs in the region! Summer opportunities featured range from music, art, farming, theater, dance, science, nature, sports, speaking, yoga, rock ‘n roll… to traditional summer day or overnight camps/programs! There’s something for all ages, toddlers to teens! Check it out and start making your summer plans! — Do you have a summer camp or program you’d like to have included in our comprehensive list? Find out how you can submit your listing HERE. Joyful learning starts with Oak Meadow! Save from Mother’s Day to Memorial Day. Enjoy 15% off Oak Meadow’s engaging, experiential homeschooling curriculum for kindergarten to grade 12, and 5% off enrollment in their fully accredited distance learning school. Oak Meadow helps you set a natural rhythm of learning for your family through their creative and challenging curriculum. Their compassionate, child-centered approach encourages critical thinking and intellectual development through hands-on activities, interdisciplinary projects, and thoughtful reading and writing practice. This May treat Mom to great savings, and treat the family to a great home learning experience! Offer runs from May 11 through May 26. Cooley Dickinson/Massachusetts General Hospital Lecture Series. Concussions in Sports: Help for Parents. As media attention on concussions in sports rises, parents are in need of common sense, research- supported information. This presentation is designed to help parents understand what they need to know about concussions and how to best support and protect their child athletes as they participate in sports. Speakers include, Richard Ginsburg, PhD, Clinical Psychologist, Massachusetts General Hospital and Jonathan Schwab, MD, Pediatrician, Northampton, Family Practice. Thursday, May 15th 6-7pm at the Hadley Farms Meeting House, 41 Russell St., Hadley, MA. Registration is required, www.cooley-dickinson.org/classes or by calling 888-554-4234. Abundance Farm Work Party and Celebration! Abundance Farm is an emerging Food Justice Farm and Outdoor Classroom on 253 Prospect Street in Northampton. This partnership between Congregation B’nai Israel, Northampton Survival Center and Lander-Grinspoon Academy will support local food security and serve as a unique, learning environment. Help launch the Farm on Sunday, May 18th. From 10-12 volunteers will create garden beds and plant an orchard. Delicious lunch for volunteers from 12-1. Celebrate from 1-3 with live music and activities for all ages including sports, cob oven baking, seed bomb workshop and bike blending! Come dressed to work and bring tools if you have them. For more info info@abundancefarm.org or visit www.abundancefarm.org. Amherst Montessori School is holding a Toddler Open House on May 22, 3:30-5:30 PM. Meet the Toddler faculty and learn about their Montessori programs for children ages 12 months – 3 years. Enrolling now for the 2014-2015 year in full-and part-time programs. Inquire about their Spanish-English bilingual classroom, La Casita! Join them in a joyful, beautiful classroom that is prepared for the child’s emerging independence. The Toddler program includes music, art, practical life, grace and courtesy, language, outdoor play, and more in a child-centered and respectful setting. To learn more, contact Laura Miller, Director of Admission, at lmiller@amherstmontessori.org, or go to www.amherstmontessori.org. ADVERTISE HERE: Reach thousands of families in Western MA while supporting the community development work of Hilltown Families! See afterschool class, community event, open house, audition, homeschool program, workshop, volunteer opportunity, wellness program, local business or non-profit featured here in the Bulletin Board section of our list of Weekly Suggested Events and in our weekly eNewsletter, reaching thousands of families living throughout the four counties of Western MA while supporting the community development work of Hilltown Families! Find out more about our enhanced publicity packages and options and how you can partner with Hilltown Families in your online marketing by emailing us at hilltownfamilies@gmail.com. JOIN OUR TEAM OF CONTRIBUTING WRITERS: Interested in becoming a Contributing or Guest Writer for Hilltown Families? We welcome writings that reflect the community building and educational efforts parents, teens, teachers, artists, activists and community leaders work towards and accomplish and how that affects, supports and empowers our families. All writing styles welcomed, including local reviews, DIY posts, seasonal cooking/local food, and community-based educational & community service learning opportunities/resources. Send your query to hilltownfamilies@gmail.com. Saturday, May 10, TBA – LOCAL HISTORY: Join the Mill River Greenway Initiative for a “Riverwalk” in Downtown Northampton. Walk from Old South Street to Hockanum Road, discovering the history of Northampton and the Mill River along the way. This walk would be best for older students interested in local history. Pre-registration required – email info@millrivergreenway.org to register; space is limited. Northampton, MA. Saturday, May 10, 9am – COMMUNITY SERVICE/NATURE STUDIES: Learn how you can help protect your local watershed and become a steward for the Westfield River at “Walkin’ the Watershed,” an event that is part of Wild and Scenic Westfield River’s Wild and Scenic Saturdays programs. Students can learn how to help care for sections of the River and how to conduct a visual survey. Meet at Buckley Dunton Lake. Call to register. 413-623-2070. Becket, MA. Saturday, May 10, 9am-11am – FISHING: Kids ages 14 and under can participate in the annual William Gray Memorial Fishing Derby, held by Ashfield Rod and Gun Club. Come have fun outdoors and spend time with family and friends. Takes place at Gray’s Sugar House. 413-628-4400. 38 Barnes Road. Shelburne Falls, MA. Saturday, May 10, 9am-1pm – PLANT SALE: Celebrate Spring and gardening season at Gardening the Community‘s Annual Plant Sale and Gardeners Gathering! Here you can find flowers for Mother’s Day, plants for the garden, and information relating to gardening. Kids can get interested in gardening and learn how to grow their own food by attending plant sales, purchasing plants, and learning each step of starting their very own garden. 256 Hancock Street. Springfield, MA. Saturday, May 10, 9am-1pm – PLANT SALE: Support Northampton’s public schools at the Support Our Schools Plant and Garden Sale on May 10 at Smith Vocational High School! Here you can find tons of different plants for your garden, and kids can pick out plants to get their own gardens started. 80 Locust Street. Northampton, MA. Saturday, May 10, 9am-1pm – FARMERS’ MARKET: After a successful first season in 2013, the Downtown Pittsfield Farmers’ Market kicks off again on May 10! Come by for local veggies, fruits, eggs, meat, dairy, breads, flowers, and other goods, as well as live music, activities, and more. First Street. Pittsfield, MA. Saturday, May 10, 9am-2pm – PLANT SALE: Find everything from flower and vegetable starts to trucks, tools, and toys at the Red Gate Farm’s Annual Plant and Tag Sale. Families can come to the Farm to shop for the garden or vegetable patch, participate in fun activities, meet baby animals, and more. Kids can learn about farming and gardening by interacting with the animals, seeing farm tools and equipment, and seeing what sorts of vegetables are for sale – get a veggie start for your child and let them plant it, care for it, and watch it grow. This gives kids a sense of accomplishment and teaches them how to grow their own food. 4 Norman Road. Buckland, MA. Saturday, May 10, 9am-5pm – PLANT SALE: The Berkshire Botanical Garden is holding their 37th Annual Plant Sale on May 9th and 10th. Come by to check out their amazing selection of plants for sale, shop from vendors, participate in a silent auction, and go to the container design station. Plant-lovers of all ages will enjoy this event, which is a fun way to find interesting plants for your garden. 413-298-3926. 5 West Stockbridge Road. Stockbridge, MA. Saturday, May 10, 10am-1pm – HIKING: Come see the location of the Berkshire Natural Resources Council‘s newest trail at Alford Springs! A new trail will be built on the property this summer, and you can learn about the process of trail planning, mapping, and building while on this hike. This moderate hike is off-trail and would therefore be best for older teens and adults. 413-499-0596. Mountain Road. Alford, MA. Saturday, May 10, 10:30am – STORYTIME/ARTS & CRAFTS: Kids ages 4 and up can hear a story and create a dream catcher at the Gaylord Memorial Library‘s Saturday Spectacular Story and Craft! 413-538-5047. 47 College Street. South Hadley, MA. Saturday, May 10, 10:30am-11:30am – ARTS & CRAFTS: Come to the Carnegie Library for a special Spring craft activity – card-making! Children of all ages can have fun making creative and colorful cards. 413-863-3214. 201 Avenue A. Turners Falls, MA. Saturday, May 10, 12noon – FIBER ARTS/KNITTING: Kids can come to the Monson Free Library to learn how to knit or improve their knitting skills! Library staff will be there to teach the basics, including casting-on, knitting, purling, and binding off. If possible, please bring US size #8 straight needles. 413-267-3866. 2 High Street. Monson, MA. Saturday, May 10, 2pm-3pm – BICYCLES/SKILL SHARE: The Sunderland Public Library is offering a Bike Maintenance Workshop for teens and tweens with a mechanic from Laughing Dog Bicycles. Students in grades 5-12 who want to learn the basics of bike repair and maintenance will love this workshop. Registration is required. 413-665-2642. 20 School Street. Sunderland, MA. Saturday, May 10, 3pm-4:30pm – LEGOS: Kids ages 6-10 can come to the Jones Library for LEGO Club! Get creative and work on your architecture skills with friends. 413-259-3090. 43 Amity Street. Amherst, MA. Saturday, May 10, 4pm – LITERACY/LIBRARY ADVENTURES: Kids can come to the Greenfield Public Library for “Experience the Book Party: Willy Wonka and the Chocolate Factory.” Get your Golden Ticket and explore the world of Roald Dahl’s Charlie and the Chocolate Factory at this fun event. Meet Charlie, Willy Wonka, Oompa Loompas, and other book characters all around the library. Registration is required. 413-772-1544 x5. 402 Main Street. Greenfield, MA. Saturday, May 10, 5pm-8pm – ART WALK: This month’s Art Walk Easthampton features the 7th Annual Easthampton High School Arts Festival at Old Town Hall! Many different styles of work by local students will be on display, and you can see work by some of the area’s most talented young artists. Students learned to mat, frame, and exhibit their own work for this event. All ages will enjoy seeing works by these gifted young artists, and there will also be other activities around town. 413-527-8278. 43 Main Street. Easthampton, MA. 7-8am – FAMILY RADIO: Valley Free Radio (WXOJ-LP 103.3FM Northampton, MA) airs encores the Hilltown Family Variety Show every Sunday morning. commercial-free family radio. Tune in on your FM dial, or listen live via streaming audio at www.valleyfreeradio.org. Listen to the Hilltown Family Variety Show podcast anytime. Click here to see 7 years of archived shows. Sunday, May 11, 10am – MOTHER’S DAY/MUSEUM ADVENTURES: Celebrate Mother’s Day at the Yiddish Book Center with fun and educational events for the whole family. You can tour the museum (11am & 1pm), participate in a workshop about the Wexler Oral History Project (11am), and a musical tribute to Molly Picon (2pm), a star of the Yiddish Theatre. All ages can explore the museum and celebrate Mother’s Day at some or all of these programs. 413-256-4900. 1021 West Street. Amherst, MA. Sunday, May 11, 11am – VOLUNTEER: Be a “blanketeer” at Wilbraham Public Library by making blankets for Project Linus. The organization provides new, handmade blankets to children who are ill or who have experienced trauma. Teens can gain hands-on experience in quilting, knitting, crocheting, sewing, etc. and learn about the importance of helping others at this event. 413-596-6141. 25 Crane Park Drive. Wilbraham, MA. Sunday, May 11, 3pm-4pm – FILM: Historic Northampton’s Fast Forward Film Series presents, “Against the Mainstream: The Animations of Lutz Dammbeck” on May 11. The screening presents Dammbeck’s animated films, which were made in the former East Germany in the 1970s and ’80s. Barton Byg, Professor of Film and German Studies at UMass Amherst, will discuss the films and answer questions. Older students interested in film, animation, and German studies will enjoy this program. 413-584-6011. 46 Bridge Street. Northampton, MA. Monday, May 12, 10am – LITERACY: The Berkshire Athenaeum presents “Fun With Math and Science,” an event for children and their parents that is part of the Every Child Ready to Read series of programs. This event will teach parents how to help their children develop early literacy skills and foster in them a love of reading. 413-499-4809. 1 Wendell Avenue. Pittsfield, MA. Monday, May 12, 4pm-5pm – BOOK GROUP: Kids in grades 1-3 can come to a book group at the Forbes Library. Read Kenny and the Dragon by local author Tony DiTerlizzi and discuss it with peers, do a craft activity, have snacks, and decide on the next book. 413-587-1011. 20 West Street. Northampton, MA. Monday, May 12, 5:30pm-7:30pm – VOLUNTEER: Teens and adults can gain experience volunteering by helping Kestrel Land Trust build bird nest boxes. This work party is the first Land Stewards Corps event of the season, and materials, tools, and instructions will be provided. 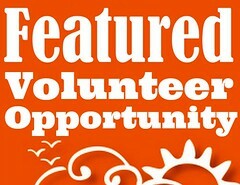 Since this volunteer opportunity requires the use of tools, it is best for older teens and adults. Email jack@kestreltrust.org or call to register. 413-549-1097. 20 Beston Street. Amherst, MA. Monday, May 12, 7pm – PARENT WORKSHOP: Parents are invited to Northampton High School for a special lecture by Rachel Simmons, titled “Girls and Social Media.” Simmons has written several books and co-founded the Girls Leadership Institute, which teaches girls skills for “assertive self-expression, emotional intelligence, and authentic relationships.” This talk will focus on how girls interact with social media, what potential problems could arise, and how to teach healthy social media use. Takes place in Fayette Congdon Auditorium. 380 Elm Street. Northampton, MA. 9:30am-11:30am – PLAYGROUP: The Northampton Parents Center is open every Monday, Tuesday, Wednesday, and Thursday from 9:30am-11:30am for playgroup, stories, snacks, and circle time. For pre-K children and their siblings. 413-582-2636. 297 Main Street, lower level. Northampton, MA. 10am-11:30am – PLAYGROUP: Play and Learn Group at the Williamstown Youth Center for kids walking-age up to age five. Includes puzzles, play dough, riding toys, balls, books, and more. 413-663-6593. 66 School Street. Williamstown, MA. 10am-12noon – PLAYGROUP: The Easthampton Family Center is open every Monday, Tuesday, and Friday from 10am-12noon. 413-527-5496. 43 Main Street. Easthampton, MA. 11am-12:30pm – PARENT SUPPORT GROUP: MotherWoman is returning to the Hilltowns for a weekly drop-in group for mothers of young children. The group offers a supportive environment for mothers to discuss motherhood and all aspects of raising young children. Takes place at the St. John’s Corner House Mission. 413-625-6948. 469 Main Street. Ashfield, MA. Tuesday, May 13, 3:30pm-4:30pm – STUDENT WORKSHOP: Teens, are you looking for a summer job? Come to the Forbes Library and work with a career counselor to look for jobs, improve your resume, and ask any questions you might have. 413-587-1010. 20 West Street. Northampton, MA. Tuesday, May 13, 3:30pm-4:30pm – LEGOS: Kids can have fun with LEGOs and practice their building skills at the Haskins Center with Child Care of the Berkshires, Inc.! 413-664-4821. 210 State Street. North Adams, MA. Tuesday, May 13, 6pm-7:30pm – PARENT WORKSHOP: Parents are invited to a Parent Cafe at the Bridge Street School! Come share information and ideas and discuss the challenges of parenting with other local parents. Parents cafes give parents an opportunity to address parenting concerns, get advice, and learn how to become the best parents they can. Childcare is provided. Please call or email bblack@northampton-k12.us. 413-587-1471. 2 Parsons Street. Northampton, MA. 9:30am-12noon – PLAYGROUP: The Belchertown Family Center is open every Tuesday and Thursday from 9:30am-12noon for drop-in playgroup. 413-283-7594. 720 Franklin Street. Belchertown, MA. 10am – STORYTIME: Come by the Goodwin Memorial Library for “Lunatunes!” a dynamic storytime with songs, movement, stories, and original art. For babies through age 5. 413-584-7451. Route 47 & Route 9. Hadley, MA. 10am-11:30am – PLAYGROUP: Weekly playgroup at Sunderland Elementary School for kids 5 and under. Every Tuesday and Friday. Old Amherst Road. Sunderland, MA. 10am-11am – STORYTIME: Join the Greenfield Public Library for a weekly storytime! This event includes stories, songs, fingerplays, and crafts for kids age five and under. 413-772-1544 x5. 402 Main Street. Greenfield, MA. 10am-11:30am – PLAYGROUP: Playgroup for pre-K kids with educational games and hands-on activities. Takes place at Haskins Center. 413-663-6593. 210 State Street. North Adams, MA. 10:30am – MUSIC: Every Tuesday until May 6, the Jones Library will hold “Sing With Your Baby,” an program for preschool-aged children and their parents. 413-259-3090. 43 Amity Street. Amherst, MA. 11am-12noon – CULINARY ARTS: Community Health Programs is offering “Kids’ Kitchen,” a cooking class for kids ages 2.5-5 that focuses on healthy food choices. This class teaches kids the importance of healthy eating at an early age and gets them interested in cooking. 413-528-0457 x1154. 442 Stockbridge Road. Great Barrington, MA. 2pm-4:30pm – LIBRARY: Kids ages 10 and up are invited to the Hatfield Public Library for Teen Tuesdays. Each meeting features a fun activity. Takes place the first and third Tuesdays of each month. 413-247-9097. 39 Main Street. Hatfield, MA. 3pm – LEGOS: Lego Club is every Tuesday at the Bushnell-Sage Library! Come to the library and make new friends while creating Lego masterpieces. 413-229-7004. 48 Main Street. Sheffield, MA. 3:30pm-4:30pm – LEGOS: Lego Club meets at the Adams Library the second and fourth Tuesday of each month. For kids 4-8. Please call to sign up. 413-664-4821. 92 Park Street. Adams, MA. 3:30pm-4:30pm – LIBRARY TIME: Kids of all ages can come to the Millers Falls Library for Library Club! This includes games, activities, crafts, and snacks. 413-659-3801. 23 Bridge Street. Millers Falls, MA. 4pm-5pm – LEGOS: Kids ages 7-12 can join the Indian Orchard Branch Library‘s Lego Questers group! Come have fun with Legos each week at the library. Space is limited; call to sign up. 413-263-6846. 44 Oak Street. Indian Orchard, MA. 5:30pm-6:30pm – PLAYGROUP: Come to Gabriel Abbott Memorial School Gym for a gym group for kids up to age 8. The group is all about indoor active play, but also includes an art project, circle time, and a snack. Siblings welcome. 413-663-6593. 56 N Country Road. Florida, MA. 6:30pm – STORYTIME: It’s Pajama Storytime at the Monson Free Library! Wear your pajamas and enjoy stories and fun. Happens the second Tuesday of each month. 413-267-3866. 2 High Street. Monson, MA. 7:30pm – MUSIC: The M.N. Spear Memorial Library is holding a Ukulele Sing Along the first Tuesday of each month. Come to the library with your ukulele (or other instruments) and have fun playing music with community members of all ages. Ukuleles available at the library. 413-259-1213. 10 Cooleyville Road. Shutesbury, MA. Wednesday, May 14, 4pm-5pm – BOOK GROUP: Young adults can come to a book group at the Forbes Library. Read The Incorrigible Children of Ashton Place: The Mysterious Howling by Maryrose Wood and discuss it with your peers. 413-587-1011. 20 West Street. Northampton, MA. Wednesday, May 14, 6:30pm-8:30pm – PLANT STUDIES: Learn about tree identification at the Dickinson Memorial Library with Michael Wojtech, author of Bark: A Field Guide to Trees of the Northeast, as part of the Northfield’s Woodlands series of programs. This is the first in a two-part program with Wojtech – part one is an animated lecture on tree identification in New England, and part two, which takes place from on May 17 9am-11am, is an outdoor workshop focused on identifying trees and learning about their bark. Older students interested in plants and ecology will enjoy this program. 413-498-2455. 115 Main Street. Northfield, MA. 9am-10:30am – PLAYGROUP: Kids from birth to age five and their caregivers can come to the First Congregational Church of Hatfield for playgroup, including snacks, stories, and songs. 413-586-4998 x102. 41 Main Street. Hatfield, MA. 9:30am-11:30am – PLAYGROUP: Stop by the Cummington Family Center for playgroup for kids 5 and under! There will be stories, arts and crafts, songs, and playtime. Takes place at Community House. Main Street. Cummington, MA. 9:30am-11am – PLAYGROUP: There will be a loosely structured playgroup at the Clapp Memorial Library every Wednesday for kids from birth to age five. 413-323-0417. 19 South Main Street. Belchertown, MA. 9:30am-12noon – PLAYGROUP: The Belchertown Family Center is open every Tuesday, Wednesday, and Thursday from 9:30am-12noon for drop-in playgroup. 413-283-7594. 720 Franklin Street. Belchertown, MA. 10am – STORYTIME: Weekly storytime at the Holyoke Public Library. 413-322-5640. 335 Maple Street. Holyoke, MA. 10am-11:30am – PLAYGROUP: Come by the Westhampton Library for playgroup the second and fourth Wednesday of each month. Features games, arts and crafts, and storytime. For kids 8 and under. 1 North Road. Westhampton, MA. 10:15am-11:15am – STORYTIME: Kids of all ages and their families are invited to the Carnegie Public Library for a weekly storytime, complete with crafts, stories, activities, and snacks. 413-863-3214. 201 Avenue A. Turners Falls, MA. 10am-11:30am – PLAYGROUP: Weekly playgroup at Erving Elementary School for kids 5 and under. Sponsored by Community Network for Children. 978-544-5157. Northfield Road. Erving, MA. 10am-11:30am – PLAYGROUP: Weekly playgroup at Wendell Free Library for kids 5 and under. Sponsored by Community Network for Children. 978-544-5157. 7 Wendell Depot Road. Wendell, MA. 10am-11:30am – PLAYGROUP: Weekly Tales and Tunes playgroup at the Leverett Library for kids 5 and under. Sponsored by Community Network for Children. 978-544-5157. 75 Montague Road. Leverett, MA. 10am-12noon – PLAYGROUP: Playgroup at the Gateway Family Center every Wednesday and Friday. 413-667-2203. 9 Russell Road. Huntington, MA. 10:30am – STORYTIME: It’s storytime at the Monson Free Library for kids ages 2-5! Come by for stories, snacks, crafts, and fun. 413-267-3866. 2 High Street. Monson, MA. 10:30am-11:30am – STORYTIME: Come to the Mason Square Branch Library for storytime, songs, and crafts. For ages 3-8. 413-263-6853. 765 State Street. Springfield, MA. 11am – STORYTIME: Weekly story hour at the Tilton Library. 413-665-4683. 75 North Main Street. South Deerfield, MA. 11am – STORYTIME: Join the Dickinson Memorial Library for storytime every Wednesday. There will be movement, stories, music, crafts, and a snack. 413-498-2455. 115 Main Street. Northfield, MA. 11am – STORYTIME: Preschoolers and their caregivers can come to storytime at the Dickinson Memorial Library every Wednesday for stories, music, movement, and crafts. 413-498-2455. 115 Main Street. Northfield, MA. 1pm-2:30pm – PARENT SUPPORT GROUP: Every Wednesday, the Salasin Center is holding a “Parents Supporting Parents” support group. Parents and grandparents can come connect and discuss parenting in this safe environment. Free childcare is available. Please call for more info or to sign up for childcare. 413-774-4307. 474 Main Street. Greenfield, MA. 3pm – CHESS: Chess Club is every Wednesday at the Bushnell-Sage Library! Come to the library and make new friends while improving your chess skills. 413-229-7004. 48 Main Street. Sheffield, MA. 3:30pm – LEGOS: Have fun with LEGOs the second Wednesday of each month at the Lanesborough Public Library! 413-442-0222. 83 Main Street. Lanesborough, MA. 4pm-5pm – WRITING: Forbes Library holds a writing group for children and young adults the third Wednesday of each month. Come do some free writing, story workshopping, and do exercises to beat writer’s block. All ages welcome. 413-587-1011. 20 West Street. Northampton, MA. 6:30pm – STORYTIME: Pajama storytime for kids ages 3-6 at the East Longmeadow Library. 413-525-5400 x1506. 60 Center Square. East Longmeadow, MA. Thursday, May 15, TBA – THEATER: Northampton High School Theater presents a production of The Odd Couple, a comedy written by Neil Simon that premiered on Broadway in 1965. This performance takes place in the Black Box Theater. 380 Elm Street. Northampton, MA. Thursday, May 15, 5pm – COMMUNITY CELEBRATION: May 15 is Third Thursday in Turners Falls! This month’s theme is “The Nature of Things,” and the evening includes tons of events relating to the river, including workshops, science demonstrations, wildlife exhibitions, performances, installations, and more. There is something for all ages at this fun event, which highlights some of the awesome things Turners Falls has to offer. 413-230-9910. Turners Falls, MA. Thursday, May 15, 7pm – OUTDOOR ADVENTURE: John and Derek Barber will be at the Westhampton Public Library to discuss their adventures backpacking in the Grand Canyon. They will share photos and stories from their trip, and will answer any questions you may have. People of all ages who are interested in the outdoor or taking their own backpacking trip will enjoy this talk. 413-527-5386. 1 North Road. Westhampton, MA. 9:45am-10:45am – ARTS & CRAFTS: The Amelia Park Children’s Museum offers weekly arts and crafts activities for kids. The theme changes each week, but the activity is always fun, educational, and often connected to other things at the museum. 413-572-4014. 29 South Broad Street. Westfield, MA. 10am – MOVEMENT: The Music and Movement program with Laurie and Tom will be at the Carnegie Library every Thursday. Young children and their caregivers are invited to this fun, free program. 413-863-3214. 201 Avenue A. Turners Falls, MA. 10am-11am – PARENT SUPPORT GROUP: New parents and their infants from birth to one year are invited to a support group at the Greenwood Children’s Center. Come share stories about the new little one in your life. 413-565-4163. 231 Maple Road. Longmeadow, MA. 10am-12noon – STORYTIME: The Dalton Free Public Library offers a weekly storytime, which includes stories, short films, and crafts, all designed to help kids with social and literacy skills. 413-684-6112. 462 Main Street. Dalton, MA. 10am-11am – STORYTIME: Stop by the New Salem Library every Thursday for nursery rhymes, tales, and tunes. 978-544-6334. 23 S Main Street. New Salem, MA. 10am-11:30am – PLAYGROUP: Sponsored by the Community Health Program (CHP), Bushnell-Sage Library is hosting a Sing-A-Song playgroup for kids 0-5 and their caregivers. Runs every Thursday. 413-229-7004. 48 Main Street. Sheffield, MA. 10am-11:30am – PARENT WORKSHOP: MotherWoman is returning to the Hilltowns for a monthly drop-in group for mothers of young children. The group offers a supportive environment for mothers to discuss motherhood and all aspects of raising young children. Takes place at the Cummington Family Center on the second Thursday of each month. 413-634-8853. 33 Main Street. Cummington, MA. 10:30am – STORYTIME: The Hatfield Public Library holds a storytime for kids 5 and under every Thursday! Come to the library for stories and fun. 413-247-9097. 39 Main Street. Hatfield, MA. 10:30am-11:30am – STORYTIME: Join the Emily Williston Memorial Library for storytime every Thursday! There will be snacks, stories, and crafts. 413-529-1605. 9 Park Street. Easthampton, MA. 3:30pm-5pm – CHESS: Every second and fourth Thursday, kids are invited to the Mason Library for chess. There will no instruction provided, so this event is best for kids who already have an understanding of the game. This is a great place to come play with peers, make new friends, and improve your chess skills in a relaxed and supportive environment. 413-528-2403. 231 Main Street. Great Barrington, MA. 3:30pm-6:30pm – FAMILY FUN: The Salasin Center will be open for family time every Thursday. Come by for activities to do with the whole family. 413-774-4307 x4. 474 Main Street. Greenfield, MA. Friday, May 16, TBA – THEATER: Northampton High School Theater presents a production of The Odd Couple, a comedy written by Neil Simon that premiered on Broadway in 1965. This performance takes place in the Black Box Theater. 380 Elm Street. Northampton, MA. Friday, May 16, 7:45am – BIRD STUDIES: Discover the birds of Williamstown with the Williamstown Rural Lands Foundation and Leslie Reed-Evans at the Mt. Greylock Trails. This walk will teach bird identification, wildflower identification, and general ecology. People of all ages and skill levels who want to learn about birds and nature are welcome to attend this walk. 413-458-2494. Hopper Road. Williamstown, MA. Friday, May 16, 3:30pm-4:30pm – CRAFTS/PLANT STUDIES: Kids can make self-watering planters and grass heads at the Forbes Library on May 16. Celebrate Spring with this fun craft activity. 413-587-1011. 20 West Street. Northampton, MA. Friday, May 16, 5pm-6pm – KNITTING: Are your kids interested in knitting? The Sunderland Public Library is offering a knitting event for teens and tweens in grades 5-12. Come work on a project or learn to knit for the first time! 413-665-2642. 20 School Street. Sunderland, MA. 9am-10:30am – PLAYGROUP: Weekly playgroup at Shutesbury Elementary School for kids 5 and under. Sponsored by Community Network for Children. 978-544-5157. 23 West Pelham Road. Shutesbury, MA. 9:30am-11:30am – PLAYGROUP: Play and Learn group for young kids at Sunderland Elementary. 1 Swampfield Drive. Sunderland, MA. 9:30am-11:30am – PLAYGROUP: Kids ages 0-5 and their caregivers can stop by Whole Children for playgroup, featuring snacks and playtime. 37 Russell Street. Hadley, MA. 10am – STORYTIME: Preschool-aged kids can come to the Stockbridge Library for StoryCraft, a storytime and craft time with Miss Vicky! Siblings are welcome. 413-298-5501. 46 Main Street. Stockbridge, MA. 10am-12noon – PARENT WORKSHOP: The Gateway Family Center is offering a weekly workshop for parents and infants 0-12 months titled “Nurturing Your Baby.” Learn infant massage, learn about infant development, meet other parents and babies, and more. This is a great workshop for parents and their young children to do together. Childcare for older children is available. Please register. 413-667-2203. 9 Russell Road. Huntington, MA. 10:30am-12noon – PLAYGROUP: Stop by the Chesterfield Community Center on the first and third Friday of each month for playgroup. Storytime, games, and arts and crafts are featured. For kids 8 and under. Chesterfield, MA. 11am – STORYTIME: Weekly storytime for preschoolers at the Sunderland Public Library. Features stories, songs, and crafts. 413-665-2642. 20 School Street. Sunderland, MA. 11am-12noon – PLAYGROUP: Play and Learn Group at Lanesborough Town Hall, featuring educational playthings, snack, art project, and circle time. For kids walking-age to five years. 413-663-6593. 83 N Main Street. Lanesborough, MA. 12:30pm-2pm – PARENT/CHILD WORKSHOP: The Storrs Library‘s Pathway for Parents is a program for families with their first baby (0-15 months). Learn about the importance of reading, music, and interactive play, and how these can benefit your new baby. Please call to sign up. 413-565-4182. 693 Longmeadow Street. Longmeadow, MA. 2:15pm-4pm – LEGOS: The Dickinson Memorial Library’s LEGO Club meets the second Friday of each month. Come make friends and build with LEGOs. Best for kids in grade 3 and up. 413-498-2455. 115 Main Street. Northfield, MA. 5:30pm – BOOK CLUB: Kids in grades 2-4 can come to the Hatfield Public Library for book club! Book clubs are a great way for kids to read for fun and then discuss books with their peers. 413-247-9097. 39 Main Street. Hatfield, MA. 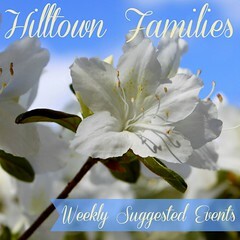 Hilltown Families’ list of Weekly Suggested Events is supported in part by a grant from the Agawam, Buckland, Cummington, Deerfield, Goshen, Plainfield, Shelburne and Westhampton Cultural Councils, local agencies which are supported by the Massachusetts Cultural Council, a state agency.